Coltness High School Interact Club is formed!! Santa tours Motherwell and Wishaw!! Photo Galleries Furniture For Families Support for “Rotary Remembers” – 2018 Rotary Poppy Pin Appeal Coltness High School Interact Club is formed!! Wishaw Disabled Games 2016 YES WE DO Schools Golf Competition - 2016 Proud to support RYLA Youth Activities Callander Cycle Challenge - 2016 Building Santa’s Sleigh SCHOOL SPEAKERS NIGHT - 2016 Rotary Primary Schools Quiz - 2017 End Polio Now 'WishWell' Project Santa tours Motherwell and Wishaw!! Tonight’s meeting of the Rotary Club of Motherwell and Wishaw was our annual "Handover" dinner where the incoming President is presented with the chain of office. 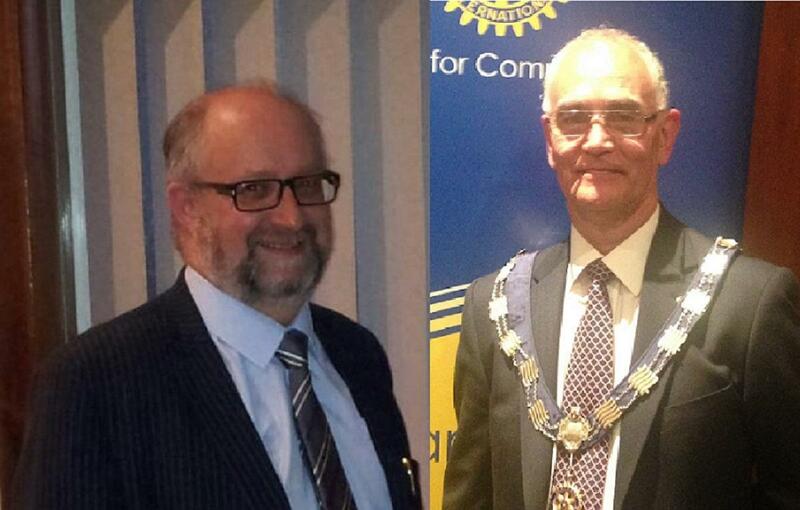 Normally, the outgoing President chairs the handover and makes the presentation, but, unfortunately, due to a family bereavement, President James Gibbons was unable to attend. However, Past President Tom Agnew stepped in to fill the breech. After explaining the circumstances to the company, Tom introduced President Margaret Keeper who brought greetings from the Inner Wheel Club of Motherwell and Wishaw. After an excellent meal, served, very efficiently, by the staff of the Bentley Hotel, Tom gave President James' review of his year in office before installing our new President, Andrew Murray. Andrew then set out his aims and objectives for the new session which starts, next Thursday, with an American themed buffet night. He then installed the new office bearers and convenors. The entertainment for the evening was provided by Valerie Barr, a third year student at the Royal Conservatoire of Music in Glasgow, who specialises in the accordion. Valerie gave the members, and guests, an exceptional performance of five classical pieces not usually associated with the accordion and this was enjoyed by all. Our new Club Secretary, John McGeary, proposed a comprehensive vote of thanks. Bonus ball winner was Ronnie Moore.